On February 17th and 18th, South Carolina and the City of Columbia will observe “The Burning of Columbia” by the Union Army under the command of General William Tecumseh Sherman. During the nearly 48 hour siege, General Sherman and his troops ravaged more than half of the City by fire and destroyed much of its infrastructure. When the fires and smoke had cleared, most, if not all, of the City’s fire apparatus and equipment lay in ruin. Many graphic accounts of Columbia’s indiscriminate destruction by the Union Army have already been written, but little narrative is spent describing the heroic efforts of the volunteer firemen of the day to control and suppress the many fires that preyed on the symbols of politics, military, education, religion, enterprise, and private properties. It is important to remember that Columbia hosted the Secession Convention at the First Baptist Church on December 20, 1860, and was the capital of the first seceding state which withdrew from the Federal Union. It was well known that the Union Army had a score to settle with South Carolina, and specifically the City of Columbia. The Independent Fire Engine Company of Columbia was one of several fire companies located throughout the City which played a prominent role during the burning of our Capital City. But, the history of this struggling fire company, in my opinion, is probably more rich and absorbing than any in the City. The pitcher and silver tray were given to the volunteer fire department in Charleston in 1859 after its members won a competition with the Independent Fire Engine Co. of Columbia. 1859….just two years before the start of the Civil War! 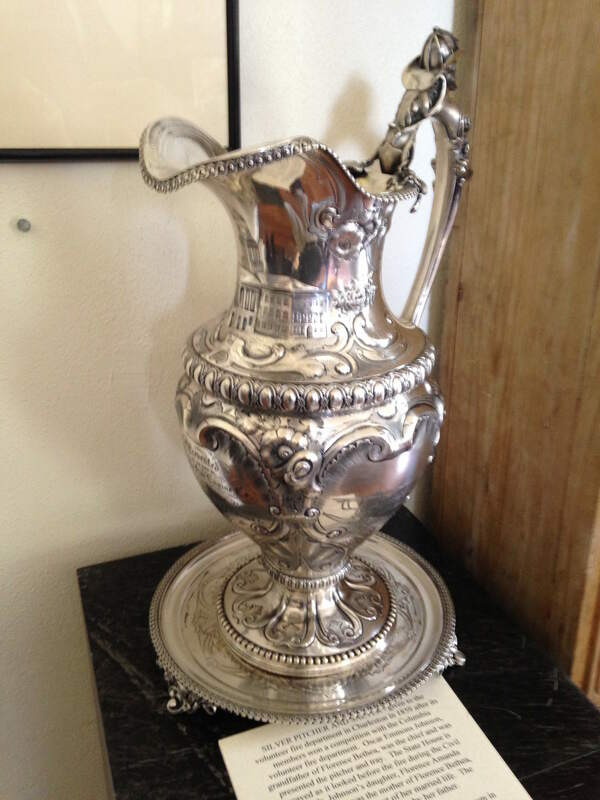 This competition trophy is confirmation that the South Carolina State Firefighters’ Association had its early beginnings from the many tournaments held around the State that served to spotlight the best of the best. The Independent Fire Engine Company of Columbia was obviously a major player on the field of many departments which competed around the State for local recognition and bragging rights. Little did those volunteer members of this little fire company realize that more than 150 years later that their works would be etched in the history of South Carolina fire service. 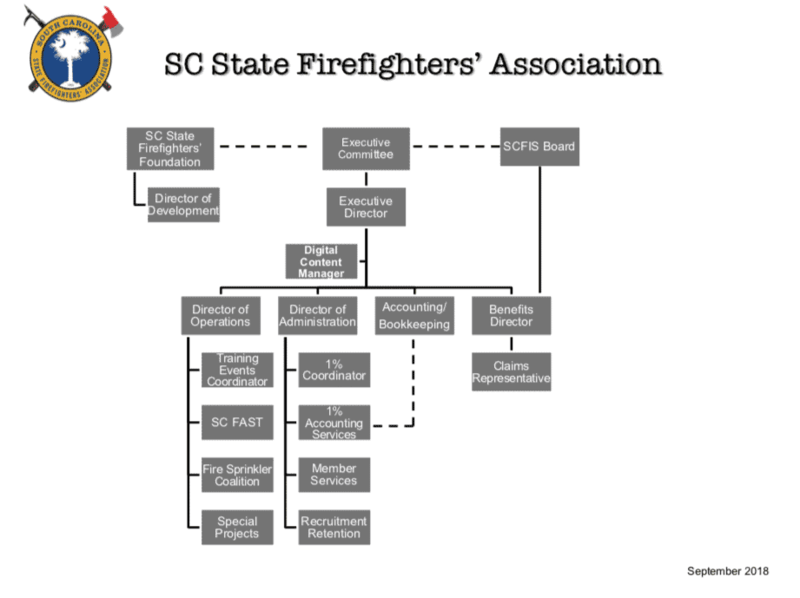 As one can imagine, the reorganization of the fire companies of Columbia was a challenge of monumental proportions. Captain Stanley, mentioned above, was later appointed to Chief of Department in1866 and tasked to inventory the apparatus and equipment destroyed, develop a plan to rebuild station houses, and devise measures to replace all that was lost, even with no financial resources to do so. It’s interesting to note that the City of Charleston responded to Chief Stanley’s requests for assistance by loaning the department a used hand-drawn pumper (hand tub) which is believed to have later been sold to the Town of Walhalla and is now on display in their headquarters station in working condition. Word spread quickly during the ensuing days that Columbia was in desperate need of rebuilding its fire department. Through the determination and skillful networking of the department’s leaders, the New York Firemen’s Association responded with great generosity by raising nearly $3,000 for the purchase of a hand-drawn hose carriage designated to be given to the Independent Fire Engine Company. The “Sickles” carriage was built by Messrs. Adams and Conne’s Carriage Repository of No. 684 Broadway in New York City, a leading manufacturer of fire apparatus. 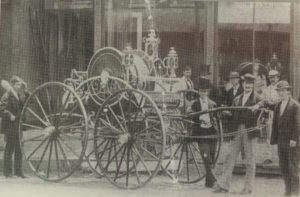 A photograph of members of the New York Firemen’s Association standing beside the hose carriage just prior to its shipment captures the pride of their members who sacrificially helped in raising the money for this acquisition. In late February of 1867, the hose carriage was carefully loaded on the merchant steamship, Andalusia, birthed at a dock in the New York harbor. On Saturday, March 2nd, the ship cast off at 3:10 P.M. under full steam toward its destination of Charleston. Tragically, the Andalusia caught fire the following day off the coast of Cape Hatteras and was destroyed. 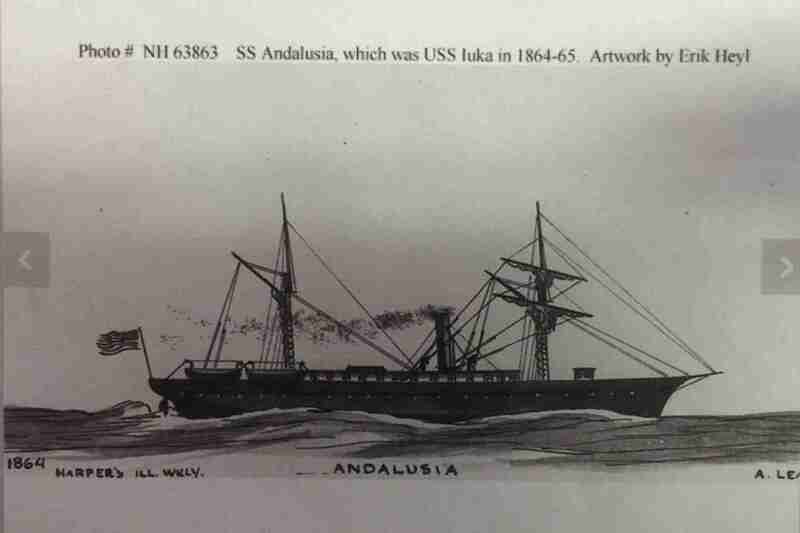 Four passengers and eight crewmen were lost in the fire and sinking of the Andalusia. Also lost was the hose carriage, equipment, helmets, nozzles, and speaking trumpets being shipped for presentation to the Independent Fire Engine Company of Columbia. September 11, 2001, was a beautiful fall day in most of the northeast. The sky was clear, and the air had the feel of autumn. People were going about their business and had no indication the stage was being set for events that would change our lives forever. At 8:46 A.M., American Airlines Flight 11 crashed into the north face of the North Tower of the World Trade Center in New York City followed in less than 30 minutes by the crash of Flight 175 into the South Tower. At 9:37 A.M., Flight 77 impacts the Pentagon in Washington, and at 10:03 A.M. a plane crashes into a rural countryside in Pennsylvania. We all know the rest of the story. In a brief 56 minutes after the second plane hit the South Tower, the symbol of America’s prosperity collapsed followed a short time later by the total collapse of the North Tower. Very quickly America knew its liberties were being attacked by Islamic terrorists who were determined to make a statement by creating as much horror, fear, and confusion as possible. Fires burned throughout buildings in the center of commerce in lower Manhattan; debris and dust spread all over New York; and the shocking degree of destruction and loss of life became apparent. When the events of the day were over and the toll was eventually revealed, America was horrified to learn that nearly 3,000 people were killed, and, of that number, 343 firefighters were killed in the line of duty. So, 134 years later, the Fire Department of New York and the great City it serves, found themselves in much the same plight as Columbia in 1865….only the number of lives lost was distinctly different. The Chief of Department (Pete Ganci), the First Deputy Fire Commissioner (William Feehan), their beloved Chaplain (Father Mychal Judge), renowned Chief of Tactical Operations (Ray Downey), and other heroes in the department’s rank and file lost their lives serving their City. Nearly 100 engines, ladders, rescues, tactical units, support vehicles, ambulances, and staff cars were destroyed. 75 of their firehouses were touched by at least one member dying in the line of duty, and many others lost entire companies. Remember the words of Colonel Samuel Melton in 1867? “Should misfortune ever be yours, I hope Columbia would obey the golden rule by which you have been prompted in the performance of this most munificent kindness to a people in distress.” Those words rang loud in the heart of retired Columbia Fire Chief John Jensen who offered his assistance to help raise money to return the favor so graciously given after the Civil War by our brothers in New York. To make a long story brief, the students at White Knoll Middle School wanted to make a difference and approached their principal and other school leaders with the idea of raising money to help purchase a fire truck to give to the FDNY. With the help of Chief Jansen and former Fire Marshal John Reich, along with many benefactors, including the membership of the State Firefighters’ Association, the story of the Independent Fire Engine Company spread like a wildfire. Newspapers, TV and radio stations, and other news outlets picked up on story. Money began pouring in at the school and at fire departments across the State given by people from all over the country who wanted to help in the cause. At first, the goal was to raise sufficient funds to purchase an engine for the FDNY, but it soon became apparent that there would be enough money to order a ladder truck. Chief Jansen was asked to select a firehouse in New York to receive the ladder truck. From his younger days as a member of the New York Fire Patrol and an avid fire buff, Chief Jansen suggested that it be assigned to Ladder 101 in the Red Hook section of Brooklyn which lost seven members of that company as well as their truck. On June 1, 2002, a group from South Carolina attended a dedication ceremony at the Red Hook station where the ladder truck was officially placed in service and ceremonially repaid the debt owed over 135 years earlier. Chief Photographer Robert Busbee, Columbia F.D. One more thought…..according to the National Maritime Museum, the U. S. Department of Navy Historical Center, and the N. C. Maritime Museum the wreckage of the steamship Andalusia has never been found. As reported, the merchant ship burned and sank off the coast of Cape Hatteras on March 3, 1867. What if….just what if the Andalusia could be found and its remains revealed evidence of the hose carriage being delivered to Columbia? I’m just saying…..
What great examples of perseverance! Thanks Carter for such an enjoyable read!